Looks very good in my second bedroom! Have heavy thermal curtains hanging from it--is sturdy and holds them well. Will buy another to hang a decorative rug over. 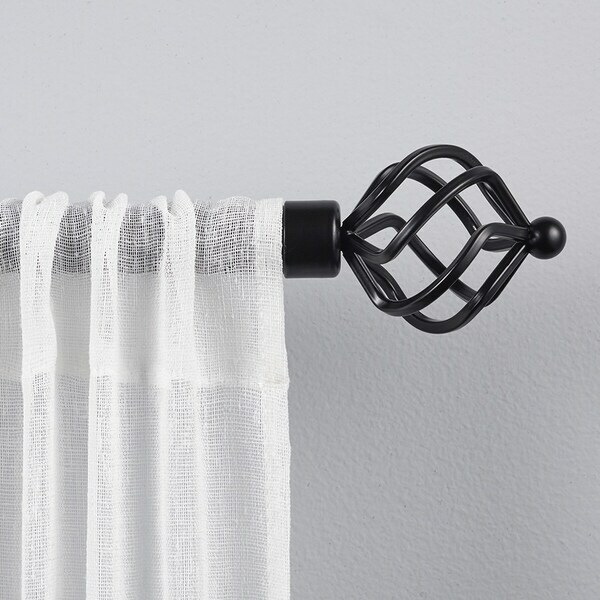 The Torch decorative curtain rod and finial set has an open, airy design with a matte finish rod and twisted iron strand sphere shape finials. This set will provide a visually balanced appearance for your window treatments. The 2.6" diameter x 3.2" long finials will insure that your window curtain panels will remain securely on the rod. The 1" diameter iron adjustable curtain rod is designed to fit a wide range of window widths, and has a sturdy 25 lb. capacity that will support flowing sheers to thermal blackout panels. The 3.5" fixed depth projection bracket provides a gracious amount of space for fabrics to drape perfectly. Accommodates window curtain panels and drapes that are designed with various tops, including: rod pocket, pinch pleat, grommets, tab top, or hidden back tab top. Provides an attractive accent to every window treatment in your living room, bed room, bathroom, kitchen, and kids room. Installs easily with included hardware and installation instructions. Sturdy, easy clean, no fuss, wipe clean finish will last for lifetime. This window curtain rod and finial set will add the perfect finish accent to any window treatment and adds a refined style to your home decor. Nice quality extended curtain rod. Only issue I had was the directions with the finial and the fact that the picture of the brackets did not match what was shipped. Took me some time to figure it all out...but finally hung and looks great! 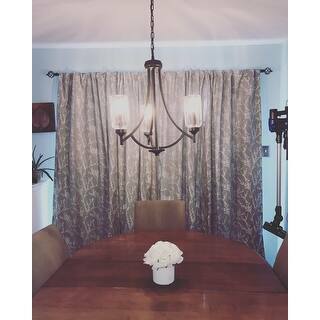 I love the curtain rods from Overstock. Not only do they look great but they are lower priced than any other retail store I have shopped. Much better quality for less price even than Walmart offers. I have furnished my home with curtain rods like these. I bought this rod for both of my boy’s rooms. I will get another for our master bedroom. It is a very nice rod, sturdy with the middle hook since we have wider windows. Nice neutral look for boys bedrooms. This rod was just what I expected with a sturdy design. I would highly recommend its purchase. The rods were well made and easy to install. Beautiful curtain rod! It came in perfect condition. Super long with an extension, which we didn’t have to use. My husband hung it up in about 10 minutes. Check out the picture!! I would so buy this again!! This curtain rod looks very attractive and classy. It functions well and was very easy to put up. I wouldn't hesitate to get another if I need it. "does this come with center support bracket?" "Are the finials detachable? I have other finials I wish to use." Yes, the finials are detachable, however we cannot guarantee what you have will fit. Windsor Home Twisted Sphere Finial Adjustable Curtain Rod Set 48" to 86"